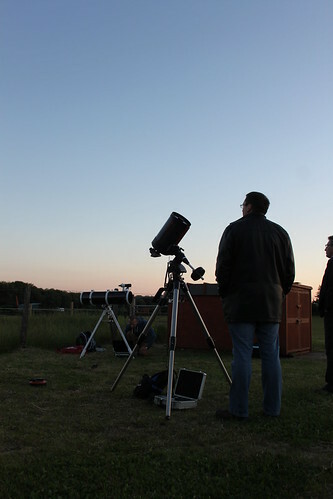 As I think I’ve mentioned before, I recently joined the Bristol Astronomical Society. 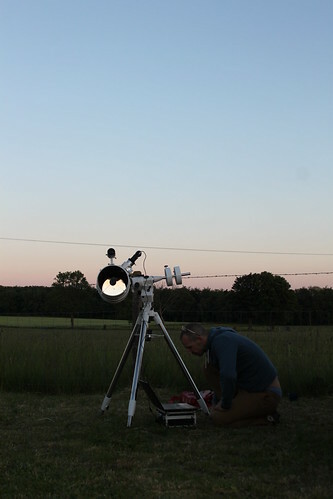 The Society is lucky enough to have a small observatory just outside Bristol and John, who manages the observatory, was kind enough to show me how everything works. This means that I’m now allowed to help out at the observing sessions that the Society runs on Saturday nights. The observatory consists of a 12″ telescope in a small dome and an 18″ telescope mounted on a concrete plinth outside. 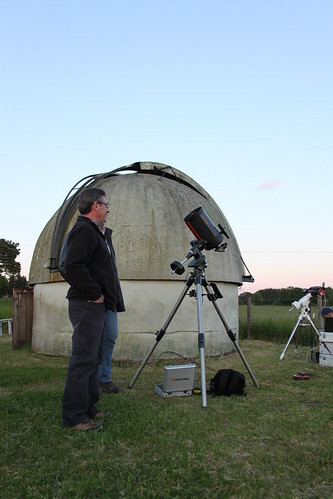 In addition to these fixed scopes, members of the club generally take along their own equipment. Some of the more experienced among them have some pretty serious pieces of kit, including computerised mounts (where you just type in what you want to look at and the scope orients itself automatically) and telescope-mounted cameras. Now, on this occasion, I’d remember to take my own camera along. 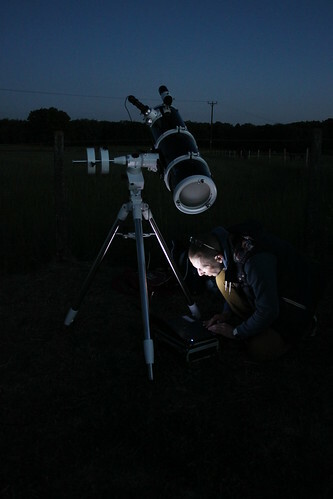 So I seized the opportunity to snap some photos of my fellow astronomers doing their thing. Here we are setting things up. You will perhaps note that we are somewhat early in getting ready, given that it’s not at all dark. But it’s a lot easier to get telescopes, cameras, laptops etc. connected in the daylight. As the sun disappeared over the horizon, a certain air of expectancy descended upon us. We began to squint towards the southern sky, where the first stars would soon make their appearance. As darkness fell upon us, things got serious. And as you can see, I wasn’t joking about the serious amount of kit that some members bring along. 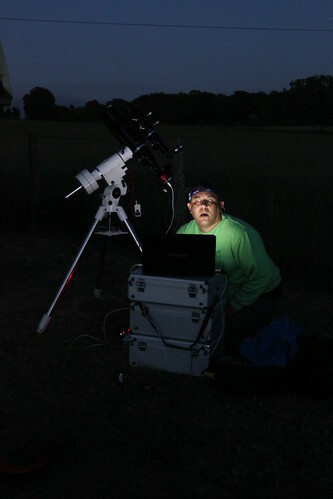 Bob here uses his telescopes and cameras to take some seriously fantastic images of deep sky objects. And I can personally vouch for the fact that it is a lot easier to put a webcam on your telescope’s eyepiece and look at the stars on your laptop, than to spend the entire night hunched over the telescope itself. This chap’s got it sussed. Unfortunately, before it had even got properly dark, the clouds came in and obscured the heavens above. But not before we’d seen the planets Mercury, Venus and Saturn, several satellites and the International Space Station. So even though it was cut somewhat short, we had a fairly decent night at the observatory. This entry was posted in Astronomy, Photography and tagged Astronomy, Bristol, Observatory, Photography by Simon Perks. Bookmark the permalink.